The following guide is updated as of 2019. If you have any more updated information, kindly, let me know and I will update it accordingly. The Israeli – Jordan border crossing is one of the few overland borders in the Middle East which can be crossed. Jordan and Israel are not the best friends in the world but both countries signed a peace agreement some decades ago so, surprisingly, travel to Jordan from Israel (and vice-versa) is pretty easy and straightforward. However, this is the Middle East, which means that there is a bunch of confusing rules you should know before crossing such a border. 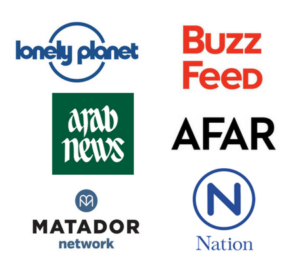 Don’t trust any information coming from an official source – If there is something I learned after 3 years of living in the Middle East is that, when it comes to bureaucracy stuff, you can’t trust the local authorities. The Middle East is the most chaotic, changing and flexible region, I have ever been. This means that you should always take any information coming from any authority, including embassies, with a grain of salt. For example, the Official Jordan Tourism board says that the Wadi Araba border doesn’t issue visas since January 2016. Well, this information is totally wrong, as I got a visa on arrival in April 2017. 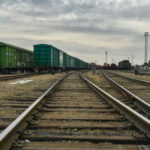 With this, I am not saying that my information is right and theirs is wrong but, at least, I try to keep this post updated based on information from travelers who crossed the border recently. Border timings – All borders are open every day, except during some specific Jewish holidays. You can find a very detailed schedule here. Israeli stamps – Israelis doesn’t stamp your passport anymore but, if you enter Jordan overland, the stamp says that you came from Israel. I strongly recommend you read my very updated post: Avoid Israeli stamps – FAQ. Crossing with your own vehicle – Entering Jordan from Israel (and vice-versa) in your own vehicle is possible but, if you plan to do a road trip in Jordan with an Israeli car, you might find your windows broken on the next day, so it’s definitely not a good idea. Israeli people change their license plate to Jordanian one at the border. Israeli visa – Most high GDP countries, including EU countries, the USA, Canada and Australia can get a free visa on arrival for Israel via any port of entry. If you are not sure about your passport, contact the Israeli embassy. Jordanian visa – Like for Israel, most people can get their visa on arrival EXCEPT if you try to enter via King Hussein bridge, the only border that requires having a pre-arranged visa. 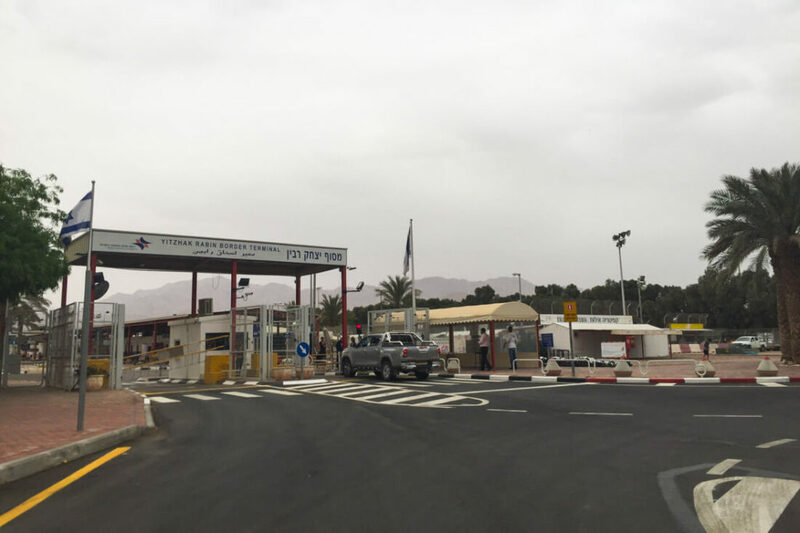 Being interrogated by the Israeli authorities – When you cross from Israel to Jordan, the Israeli authorities are pretty friendly and they don’t give you too much hassle. It’s when you enter Israel from Jordan that you may be interrogated for some time. However, there’s nothing to worry about. Just answer their questions and you won’t have any trouble. Once, I entered Israel with stamps and visas from UAE, Lebanon, Iraq, Oman and Iran and nothing happened. 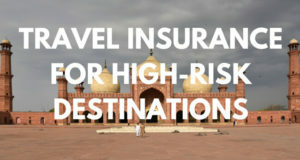 However, some travelers have reported different experiences. Read more about it: Avoid Israeli stamps – FAQ. Getting from the different borders to the cities – At all the borders, there will be taxis waiting for you. At the Wadi Araba / Yitzhak Rabin border, you are not allowed to go to Aqaba City by foot (3km). They claim it’s a military road but, in my opinion, they just say that, so you are forced to take a taxi. Normally, the taxi fares are set at all the borders and you should find a signboard, saying the price of each destination, including Wadi Rum, Petra and places like that. However, one piece of advice: border taxi fares are fairly expensive. If you are on a budget, you should take a taxi to the nearest city and take a bus from there. 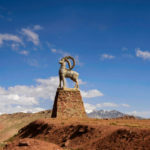 You can pay by card at the border – According to two different travelers, it’s possible today to pay by credit or debit card at the different borders, at least at both Allenby and Wadi Araba borders. 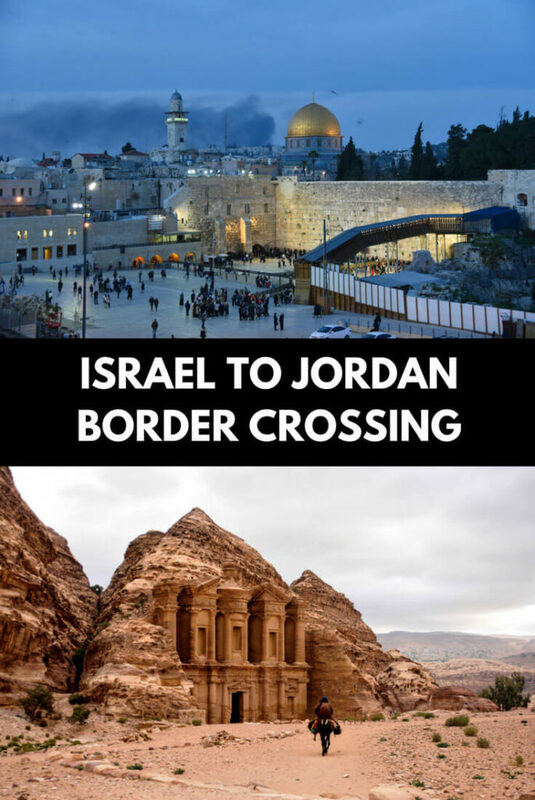 For crossing from Israel to Jordan (and vice-versa) there are three open borders. Which one should you go through? Well, each border has its own specific rules, so it will all depend on your time, money and final destination. This is the border located in Jericho, which is also very close to Amman. Very convenient if you are planning to go Amman and you are in Jerusalem or Jericho. Jordanian visa is not available on arrival, which means that you’d have to apply for it at the Jordanian Embassy in Ramallah. According to a German traveler who applied for it in March 2017, it costs 100USD and you get it at the moment. The Israeli exit fee is more expensive than any other border: 176ISL (50USD) vs 105ISL (29USD). It’s 220 kilometers from Petra and 320km from Wadi Rum, which means that it’s not the most convenient one if you’re going in this direction. Important! If you fly into Jordan, enter Israel overland (from Jordan) and plan to re-enter Jordan again, you need to know that the visas issued at Queen Aila airport are only valid for one single entry. However, one exception applies. You’ll be allowed to re-enter Jordan on the same visa ONLY if: you exit and re-enter from Allenby / King Hussein Bridge. From Damascus Gate in Jerusalem, there are direct minibusses. Price: 40ISL (1USD1) + 5ISL (1.40USD) for luggage. Alternatively, you can travel to Jericho (Palestine) on a local bus (it’s only a couple of kilometers from the border) and stay there for 1 or 2 days. If you are planning to go to Jerusalem or Tel Aviv and you are in Amman, this border is really convenient. Unlike when you come from Israel to Jordan, the Israeli visa is available on arrival. If you are in Petra or Wadi Rum, this border is very, very far. A bus to the border costs 8JD (11.30USD) but be aware that the station is a bit far and a taxi costs 5JD (7.50USD). Therefore, if you travel with someone else, it is more convenient to go directly by taxi the border, as the local price for a taxi is 26JD (36USD). Ask your hotel/hostel to arrange it for you. Once you crossed the border successfully, the shuttle bus to Jerusalem costs 7.50JD per person plus 1.50JD per bag. Budget Hostel – Abraham Hostel – The most famous hostel in Israel is a massive building located at the heart of the Old City of Jerusalem. The owners are great and they organize all sort of activities: from endless tours to pub crawls and much more. This is one of the greatest hostels I have ever been. Backpacker Hostel – Jordan Tower Hotel – Good for both backpackers and people who like to stay in a private room, this hotel has become a classic in Amman. Great staff, good breakfast and awesome location (in Downtown) are the reason why you should stay here. Mid-range hotel – 7 Boys Hotel – A really good mid-range option that has hosted travelers from all over the world. This is the southern border, shared between the Israeli city of Eilat and the Jordanian city of Aqaba. At this border, there’s a FREE VISA available on arrival, with some exceptions (see below). 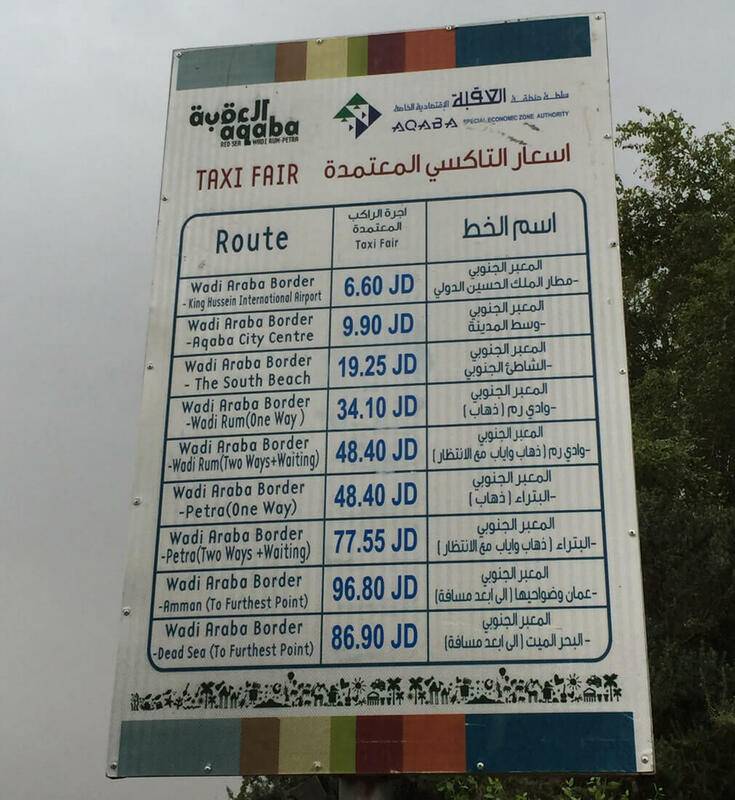 They will give you the Independent Travelers’ Entry Manifest through South Wadi Araba Crossing Border”, which you need to keep upon your departure. It’s very important not to lose it. The Israeli exit fee is only 105ISL. Very convenient if you are going to Petra (130km) and also Wadi Rum (64km). It’s very far from Jerusalem and Amman (300km and 340km, respectively). There’s a FREE VISA but, if you are one of the exceptions, it can be really expensive. 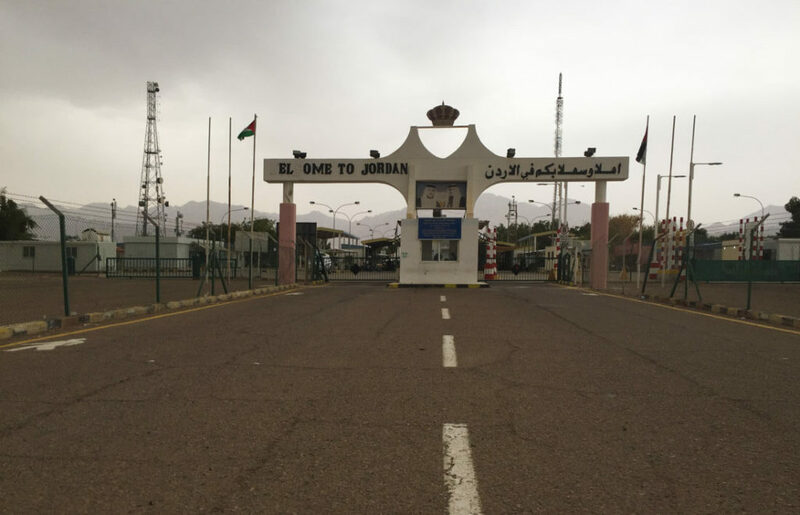 Important information – You may have read from different sources (including the official Jordanian website) that they are not giving free visas anymore at this border. The truth is that they have been saying this since May 2017 but there is not a single traveler I know who has paid for their visa since then. As I told you at the beginning, you shouldn’t trust any official source but just facts from travelers. Further updates regarding this topic are more than welcome. Exceptions: The visa is free but only if you plan to stay in Jordan for more than 2 nights. 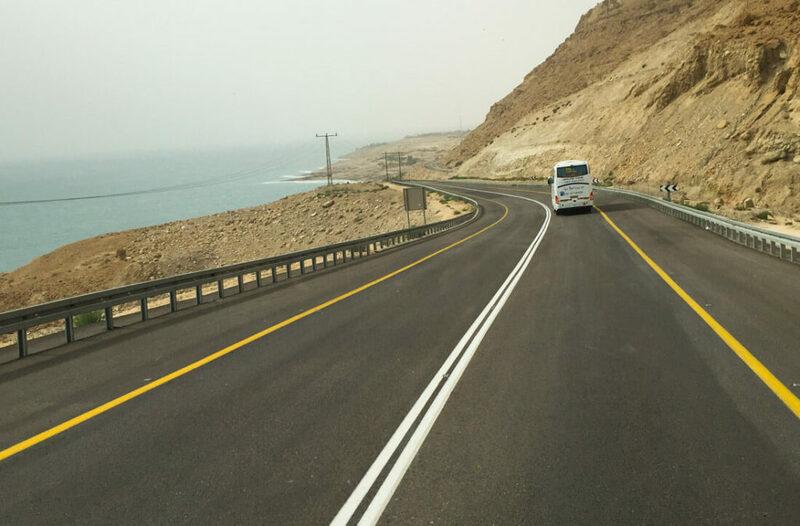 If you spend 1 night or less in Jordan and come back to Israel through the same border (Wadi Araba), you’ll have to pay a 60JD fee upon your exit. If you stay 2 nights and you also come back to Israel through the same border (Wadi Araba), you’ll just pay a 10JD fee. If you exit through a different border than Wadi Araba, you will always pay a flat fee of 10JD, regardless of the visa type and length of your stay in Jordan. Furthermore, if you leave Jordan by plane, you won’t have to pay any extra fee, regardless of how many nights you stayed there. There are direct buses from Jerusalem Central Bus station to the Israeli city called Eilat. I’m not sure about the price as I traveled there from Jericho but, from Jericho, I paid 60ISL. Very convenient if you are already in Petra (130km) or Wadi Rum (64km). If you had entered Jordan through this border and spent more than 2 nights, you won’t have to pay any exit fee. If you had previously entered Jordan through this border and only stayed 1 or 2 nights, you may end up paying a lot of money. From Aqaba, you can take a taxi the border and, from Eilat, there are buses to many places around Israel. Backpacker Hostel – Almog Eilat Backpacker’s Inn – One of the most budget options in Eilat is a pretty cool, modern hostel. Nicer – Palm Diving resort – Not a resort but a cool house with a garden that has really decent budget rooms. In fact, this is one of Eilat’s favorites. Aqaba has great accommodation but it’s a little bit pricey and the cool places are meant to relax and stay, at least, for a few days, as they are right next to the beach. However, I do recommend staying in Aqaba for a few days and go snorkeling (or diving) in the Red Sea. Beach Hostel – Darna Village Beach Hostel – One of the best-rated hostels in Aqaba and the most backpacker friendly. Darna is just 50 meters from the beach and the coral reefs. Budget Hotel – Aqaba Roza – A very decent budget hotel located in a very central location. I would say this is a very functional place for those just transiting in Aqaba. This is the least transited border, located in the north. Visa is available on arrival. It’s very close to the Roman ruins of Jerash (50km). The Israeli exit fee is 105ISL. If your destination is Amman and you don’t have a visa, you should use this border, instead of Wadi Araba. You have to pay for the Jordanian visa, which costs 40JD. It’s so far away from both Petra and Wadi Rum. If these are your destinations, you shouldn’t enter through this border. From Jerusalem Central bus station, there are daily buses (except for Shabbat) to Beit She’an (7km away from the border). Price: 42ISL. From here to the border, you will have to take a taxi. The nearest city is called Irbid and taxis charge around 20JD. From there, you will easily find a public bus to anywhere in Jordan. To be honest, unless you are already in Jerash or somewhere in the north, there is no reason to use this border for entering Israel, as King Hussein bridge is much faster and more convenient. These are the rules that apply on each border. I entered Jordan through Wadi Araba / Yitzhak Rabin border because it was visa-free. It was not the most convenient one for me, as my final destination was Amman (I had my flight to Pakistan on the next day) but, for 6JD ($9), I took a bus from Aqaba to Amman (5-6h). If you have any more up-to-date information or you think there is something wrong, let me know! Safe travels! Good overview of the options. I love that you went through the pain of collecting all the different visa/exit fees — that can be really confusing! May I add that you can also catch a convenient bus from Nazareth to Amman (bookable via AbrahamTours, AbrahamHostels tour company)? I’ve linked up to my experience taking that bus. Hi Carola, thanks for your comment! I didn’t know about this tour! But why is it leaving from Nazareth and not Jerusalem or Tel Aviv? It would make more sense as both hostels are there! That definitely does sounds confusing and lots of rules. This is going to be helpful to me and many others that may cross these borders. Thanks so much for sharing your knowledge. Your welcome! Surprisingly, this border is quite transited and frequented by tourists. Let me know how it goes! Good job on the border crossings, Joan. I only knew about the King Hussein Bridge border crossing. This might come in handing for when I head back to Israel! You have a mistake for Allenby/King Hussein Bridge – it’s not the closest to Petra, it’s over 400km away from Petra. The closest crossing to Petra is Arava near Eilat/Aqaba. Hi Amos, thank you for this. I am updating this article and making all respective changed. You’re right in some of the things you mention but I just doubled check and Petra is 220km from Allenby, not 400. Thanks! It says that the visa is required for all borders and is no longer available on Wadi Araba border. Thanks for pointing this out. However, in my experience, after 3 years of living in this region, when it comes to bureaucracy, you can’t trust what the local authorities said, as everything is a chaos, things change overnight and they are extremely flexible. The proof is that I got my visa as an independent traveler at Wadi Araba border in March 2017, so we can’t really trust what the official source says. I am not saying that I’m always right but any official source should be taken with a grain of salt, including embassies. You’re right, I meant over 200 km, not 400km. Anyway, Eilat/Aqaba border is the closest to Petra, and it makes much more sense to get to Petra from Israel via Eilat (it’s shorter + no visa hassle like in Allenby..), so definitely a winner. Thank you so much for such a detailed post. We are very confused about something and hoping maybe you would be able to help us..
We emailed the Israeli embassy to ask how to convert our single entry visa to multiple entry but we haven’t heard of a way from them. We cant find any resources online either. Do you know by any chance what is our best option in this scenario? Hi Megha, thanks for your message but I am afraid I can’t help you as I don’t know what are the special requirements for your passport. Normally, most nationalities would get a free visa on arrival, so not sure how to deal with your case. Best wishes. Hi, thanks for this info. I really think it would help us as we are planning to travel to Jerusalem & Nazareth soon this year. 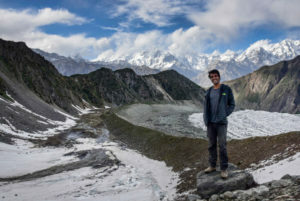 Just one point to ask; is it okay to travel there with no tour guide? We intend to travel as backpackers. Whilst referring to all of these borders as Israeli may be technically correct on an immigration basis but when referring to any border with the West Bank it is a denial of the Palestinians legitimate claim to the land. A blog post like this is not the place to get into the arguments on the issue of course but I think it at least deserves inserting the word Palestine in brackets after Israel where appropriate. Useful info thanks. I think you’re trying to push politics into a technical guide..
How could referring to a the Israeli-Jordanian border is denying the Palestinians claims or rights? 1) The Allenby border crossing has been established as a result of the Israeli-Jordanian peace treaty in 1994. If Jordan signed this treaty, are you claiming that Jordan is denying the Palestinian’s rights and claims to the land? 2) The Israeli government has recognized the Palestinians’ right and claims to self determination in the land, in the Israeli-Palestinian Oslo agreement in 1993. 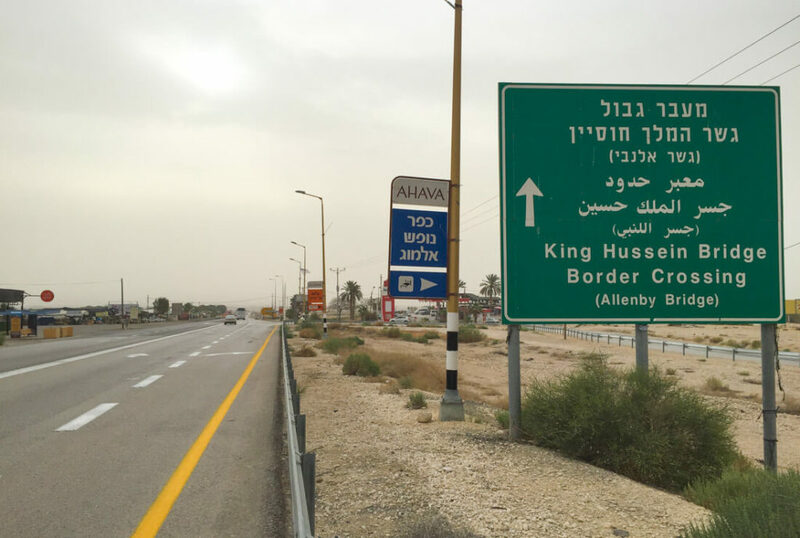 Additionally, in the Israeli-Palestinian interim agreement (signed in 1995) Allenby border crossing is agreed to be under Israeli control while serving the Palestinian population. Are you claiming that the Palestinians, including their leader Yasser Arafart who signed this treaty, are denying their own legitimate claims? Allenby border crossing has two terminals – an Israeli terminal west to the Jordan river, a Jordanian terminal east to the Jordan river. Acknowledging that is just acknowledging reality, as it is on the ground and as it is recognized by the Palestinian government and by the Jordanian government. I agreed that the term used is technically correct but wouldn’t a Palestinian say they were crossing the Jordanian – Palestinian border. Would a Palestinian call it the Israeli border when they perceive it to be the entry or exit to Palestine? If that is true then it would seem respectful to use a term that acknowledged the fact, eg putting Palestine in brackets after Israel. If you’ve spoken to Palestinians about it and they call it the Israeli border then I’ll happily take your point, it just seems unlikely to me. I’ll certainly ask when I get there. Palestinians (and Israelis) call it just “Allenby” border, or sometimes the “Jordanian” border. Maybe the Jordanians call it the “Israeli” border, that’s how things go. Anyway, Palestinians crossing back from Jordan are indeed on their way to Palestine – but they have to go through Israeli controlled areas to do so, but their final destination is Palestine (which is “Area A” of the West Bank). 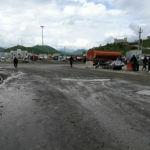 Palestinians have bus shuttles from the Allenby terminal to the bus station in Jericho, and from there they can take another bus or servees shuttle to other destinations. So, as a Palestinian you’re obviously ‘in transfer to Palestine’ but your’e not crossing the Jordanian-Palestinian border, there’s no such thing (niether technically nor as a figure of speech). It’s just ‘Allenby’ border or sometimes the ‘Jordanian’ border. I am confused about the Visa you get at Queen Alia Passport. My friend, who is a dual U.S./Israel citizen works in Saudia Arabia. He enters/exits that country with his US Passport that has a Saudi Work Visa (I thnk that is the type). He wants to visit Israel this summer. His thought was to use his U.S. Passport with Saudi Work Visa to enter Jordan at the Airport, exit Jordan via the King Hussein bridge up north using that same passport but asking Jordan not to stamp that passport; enter and leave Israel with his Israeli Passport, and finally enter Jordan at the King Hussein Bridge using his U.S. Passport with the Jordanian Visa he got at the Queen Alia Airport. Are you saying that visa will not work??? Does he need to purchase a separate entry visa for his Israeli Passport, noting also that he won’t be returning to Israel for another year? I have entered through Wadi Araba and left through Sheikh Hussein one week ago. I had to pay 10JD exit fee even though I stayed 5 days, so the statement above is not entirely correct. Border official said that everyone has to pay it regardless of visa type and length of stay in Jordan. – pay for the taxi from Isreal crossing to the destination, there is no public transportation – cheapest option is 50NIS to Beit She’an (70NIS to railway station). I recently returned to Jordan from Palestine over the Allenby /Hussain bridge border using my visa on arrival from Queen Aila airport just before the month was up so the two week rule you mention must have changed. I checked at the Jordanian Embassy in Ramallah first and they assured me I’d be ok up to the one month visa date. No one at the border made any comment . 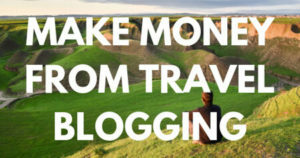 This is a great read with wonderful tips. After reading various posts from a multitude of forums, I am unsure what’s the best way to Jerusalem via Dead Sea. Would you be so kind and patient to let me know what’s the best way to get to Allenby bridge? As well, what can I expect once I get to the border and how much JOD or NIS I should carry to pay for any necessary fees? I’ll be traveling to Jordan and onwards to Jerusalem and Tel Aviv (by land) before flying out to go home this October. Any tips for a smoother trip would be amazing! Many thanks! Hi Anne. Buses to the border leave from Damascus gate in Jerusalem. For that border, you will need to arrange your visa in advance, hope you are aware of this. I am not sure about how much money you need but there are exchange offices at the border and I think that you can even pay by card. Thank you for your swift reply! Eeps!! I should’ve been a bit more specific. I’ll be leaving Dead Sea from the Jordan side and I have a Jordan pass that will cover my visa. The confusion is really about transportation and transferring from Jordan to Jerusalem. Thanks again! Can anyone confirm that crossing to Jordan via Eilat still qualifies to free visa (staying 3 nights in Jordan, and leaving by air with EU passport). Do you know the rules on bringing pets? Hi Adam, I don’t know about this, so sorry. I am flying into Jordan/Amman on a UK passport….albeit from Hawaii, where I live. I will get visa on arrival. I plan to cross after 10 days to Israel on Allenby Bridge on a Sunday. I am a solo, female traveler, 67 yrs. Any tips? Thank you so much. I have actually decided to go from Aqaba to Jerusalem, via Eliat. Working out taxi and bus now. Your posts are SO helpful. Mahalo. Hello, I read a comment that you are not allowed to bring food throught Jordanian border, but it was just a single comment on the internet. Can anyone confirm or disprove it, please? Hello, First of all thanks for informations and helps . I am Turkish citizen and will travel in Jordan for 5 days and is it possible for me to pass to Israel for a day to see Eilat. Normally we should apply for a visa to visit Israel so is it possible to get visa at the Wadi Araba Gate? Another question , I will be in the city of jenin , do you hear about the north gate hotel ? Hi there, sorry but I don’t know about any tour operator. I did everything by myself. Cheers.